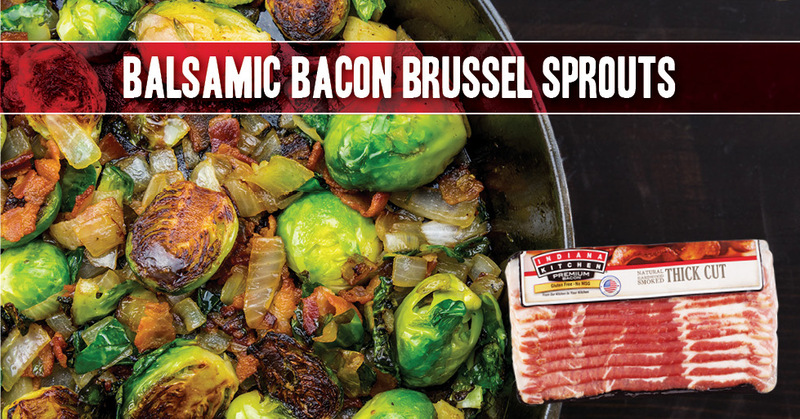 And you thought eating Brussels spouts was—well—boring… Eating them just got a whole lot better thanks to bacon. Remove the bacon from the pan, and set aside. Remove most of the bacon grease from the pan. Leave just enough to coat it. Cut Brussels sprouts in half lengthwise. Place sprouts, butter, garlic powder, and sea salt into the frying pan. Sauté on medium heat until the sprouts are browned and tender. Assemble by threading one end of the bacon onto the skewer. 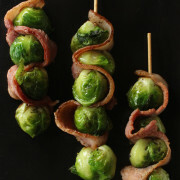 Add a Brussels sprout slice, then weave the bacon overtop of the sprout, then back through the skewer. 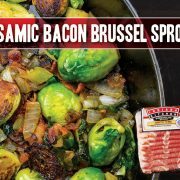 The bacon creates a curved pattern between the sprouts. Slide the bacon, and the sprout, down the skewer, and repeat this process 2-3 more times per skewer leaving enough room at the top to grab the skewer. Place in a single layer inside a roasting pan. Bake for 5-10 minutes, or until the bacon is fully cooked.